MMS MAY 2018 110 mmsonline.com BETTER PRODUCTION ADDITIVE MANUFACTURING processes. The company just needed to find a cost-efficient machine that could produce parts of the quality it needed. Mr. Pruitt had used Markforged 3D printers for tooling at a previous shop, and he thought one of them might fit the shop's needs. "I didn't want us to spend a decent amount of capital on something that wasn't going to produce a quality product," he says. "I knew Markforged had good software, a good user interface and would be reliable." He reached out to equipment provider Adaptive Corp., and metrology and additive manufacturing specialist Frank Thomas took the call. The shop wanted to 3D print the strongest, lightest parts possible without having to invest in metal additive technology. Mr. Thomas rec- ommended the Mark Two, part of Markforged's series of desktop systems. The machine prints industrial materials including carbon fiber, fiberglass and Kevlar, as well as a chopped-car- bon-fiber filament that can be reinforced with continuous fiber called Onyx. Parts made with Onyx are said to have twice the strength of other 3D-printed plastics, as well as a high-quality sur- face finish and high heat tolerances. Mr. Thomas did a benchmarking exercise with the Mark Two for the shop. He printed some parts, tracking the cost and print times. 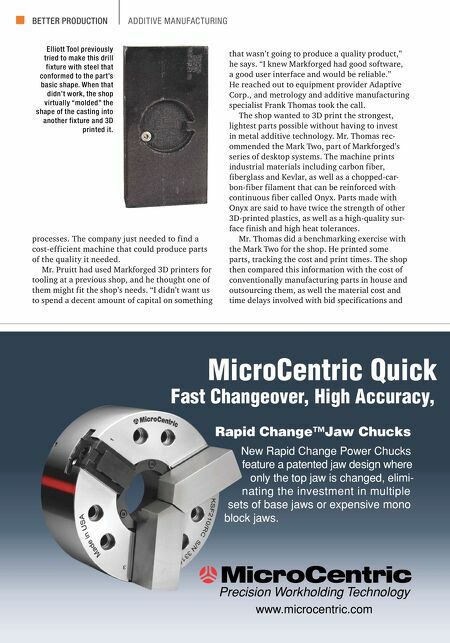 The shop then compared this information with the cost of conventionally manufacturing parts in house and outsourcing them, as well the material cost and time delays involved with bid specifications and Precision Workholding Technology www.microcentric.com New Rapid Change Power Chucks feature a patented jaw design where only the top jaw is changed, elimi- nating the investment in multiple sets of base jaws or expensive mono block jaws. 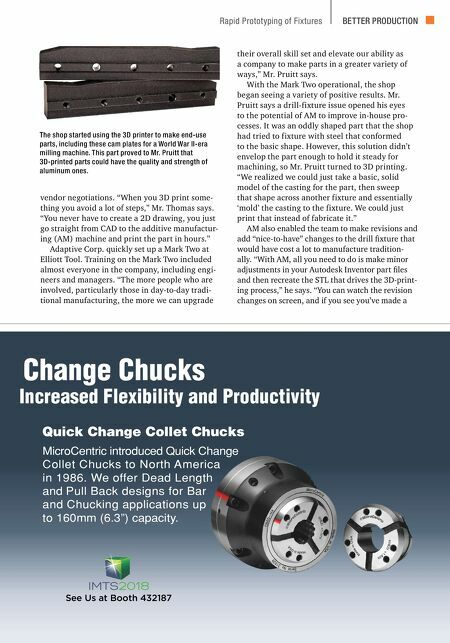 Rapid Change™Jaw Chucks Fast Changeover, High Accuracy, MicroCentric Quick Elliott Tool previously tried to make this drill fixture with steel that conformed to the part's basic shape. When that didn't work, the shop virtually "molded" the shape of the casting into another fixture and 3D printed it.